Number of pages 320 Number of pictures 542, charts 19, drawings 23. 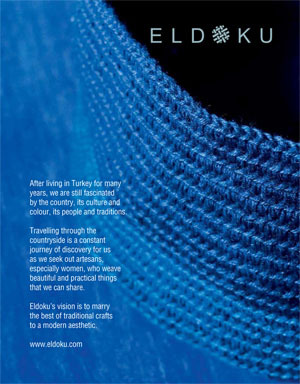 Published to coincide with The Splendour of Anatolia exhibition at the Kunsthal, Rotterdam Feb 2nd to June 1st 2008. ‘In this new volume, completed with the collaboration of the legendary photographer and ethnographer Josephine Powell and of Dr Atlihan, and magnificently and profusely illustarted with colour photographs and line drawings, Böhmer has taken his scientific research, and his unparalleled knowledge of Anatolian carpets and kilims, resulting from decades of fieldwork, into a new level of contextualisation within the vanishing nomadic culture’ from the foreword by Walter B Denny. The camel in question graces the glorious cover of this beautiful book which contains around 600 photographs of Turkish nomads taken over the decades, mainly by Harald Böhmer. Other classics include a shot of his long-term collaborator, Josephine Powell, camera-eyeballing a fighting camel; a dust storm; performing bears; spinning, weaving and braiding; breads, butter and cheese; giant sheepdogs; glowing mothers and children; and everything to do with yurts, tents and shepherds’ huts. The pictures are suffused with bubbling smiles and good humour, in contrast to the struggle that has coloured their subjects’ honourable, archaic existence. Life is hard for nomads, but as they disappear, humanity will be the poorer. Every time you look at these pictures, they seem to take you further into the world of the Türkmen and the Yürük, and of the once all-powerful White Sheep (Akkoyunlu) and Black Sheep (Karakoyunlu) clans. Böhmer has produced an uplifting testament to Turkey’s last nomads, the portrayal of whom was his life’s work as well as that of his wife, Renate, and the late, much-missed Josephine Powell. I recall from thirty years ago how whenever I stayed with the Böhmers in Istanbul or in Oldenburg, in northern Germany, Harald would at every moment be writing up his work, planning trips, tinkering with dye experiments, preparing exhibitions or debating ideas about the great theories described at the end of this book. Their Istanbul flats were knee-deep in books, maps, photographs, textiles and objects – and of course the dye plants involved in their ethnographic studies and the Dobag natural-dye project, which would revolutionise the way villagers made rugs, using natural dyes once more. There would be dyes in cooking pots in the kitchen and saturated coloured wool hanging on the verandah. An unrivalled anthropological photographer, Josephine Powell was also an extraordinary researcher and a focal point for Turks interested in their own nomadic culture. To call her a persistent thinker and lover of debate would be an understatement. Harald and Renate additionally had chemists’ discipline and methodology. This book shows he is also a great photographer. They made a splendid team, all gaining from each other. In the tradition of significant ethnography, they made repeated visits to different families and groups of nomads over many years – a method shared by Caroline Humphreys and described by her as “a long conversation”. 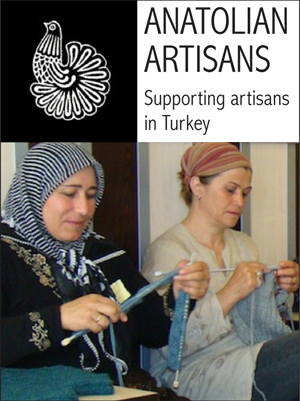 In addition, there was their love of Anatolian textiles. For Josephine this started with bags used by nomads, progressing to other flatweaves and chii, the wrapped-reed screens as yurt walls. In a complementary way, Harald and Renate followed piled and unpiled weavings – though unusually: through the dyes used. 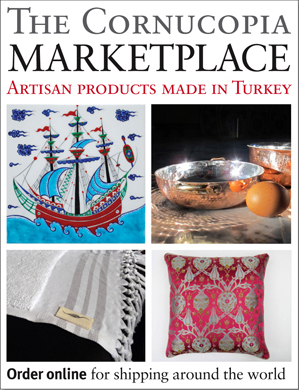 The book’s second part covers historical textiles of the Anatolian nomads and features over a hundred rugs, bags and screens – mainly flatweaves. Diagrams show how they are used and close-ups focus on weaving techniques. 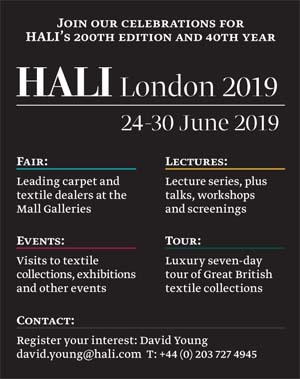 The textiles are further placed in context by short but profound essays on such intractable subjects as the origins of kilim patterns and Anatolia’s 10,000-plus years of cultural history. These almost political questions are best saved until one has much experience and wisdom and have matured well under Böhmer’s prolonged critical examination. The translation reads more fluently than his earlier books and captions with accompanying diary extracts give dates, locations and often names of the nomads happily sharing their lives. Turkey’s nomads have a proud oral culture but, except for rare messages on tombstones – such as “This life is ended, the road never ends” – photographs are the only way to reanimate the legacy of their objects. The pictures showing the fiendishly difficult skill of erecting a yurt so that it stands straight and strong reminded me of Josephine Powell laughing. Buying her first yurt, she found it unexpectedly inexpensive. This turned out to be because she had inadvertently bought only the top “wheel” and not the yurt’s sides – those required another expedition. But no need to worry today. Here, enriching the pictures, are clear diagrams of tents, shepherd’s huts and looms; historic and current maps relevant to transhumance and migration. Buy this book. 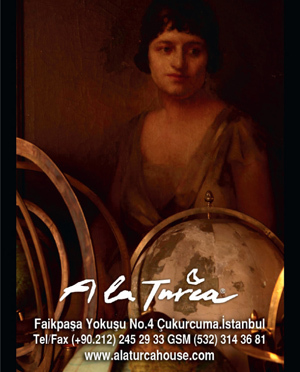 It is a classic, and its primary approach will not be seen again, for the authors’ friends and subjects - the nomads of Anatolia - have virtually disappeared.